NYC, 02/22/2019, 7:00PM. 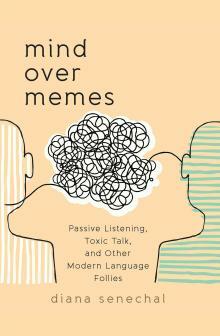 Mind Over Memes: Passive Listening, Toxic Talk, and Other Modern Language Follies. Too often our use of language has become lazy, frivolous, and even counterproductive. We rely on cliches and bromides to communicate in such a way that our intentions are lost or misinterpreted. In a culture of "takeaways" and buzzwords, it requires study and cunning to keep language alive. Diana Senechal examines words, concepts, and phrases that demand reappraisal. Targeting a variety of terms, the author contends that a "good fit" may not always be desirable; delivers a takedown of the adjective "toxic"; and argues that "social justice" must take its place among other justices. This book also includes a critique of our modern emphasis on quick answers and immediate utility. By scrutinizing words and phrases that serve contemporary fads and follies, this book stands up against the excesses of language and offers engaging alternatives. Drawing on literature, philosophy, social sciences, music, and technology, Senechal offers a rich framework to make fresh connections between topics. Combining sharp criticism, lyricism, and wit, Mind over Memes argues for judicious and imaginative speech. Diana Senechal is an educator and author whose writing has appeared in The New Republic, Education Week, American Educator, and The New York Times. Senechal is the 2011 winner of the Hiett Prize and the author of Republic of Noise: The Loss of Solitude in Schools and Culture (Rowman & Littlefield Education, 2012), which was a Choice Outstanding Academic title. She now teaches at the Varga Katalin Gimnázium in Szolnok, Hungary..